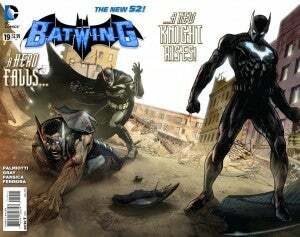 The introduction of a new Batwing is hardly a spoiler at this point; incoming series writer Jimmy Palmiotti has already teased it, admitting at WonderCon this weekend that the character would be someone near and dear to the Bat-family. And while there was a bit of speculation among fans as to who the character might be (with some fans even fantasizing briefly about someone like Terry McGinnis), the choice for the new Batwing is surprisingly obvious--and yet one that will have a lasting impact on the Bat-family's dynamic, especially in the wake of Death of the Family. That's right--this week, in Detective Comics #19/900, Batman has lost his son and when he reaches out to the other members of his team, they're non-responsive. Batgirl and Red Robin don't return his calls, while Nightwing has moved to Chicago to get out of the toxic environment of Gotham. And while Batwing has nominally been part of the Bat-familiy through Batman Incorporated, this week's issue of Batwing gives the character a new look, a new identity and (unsurprisingly) moves him from Africa to Gotham City. That's because Luke Fox, one of Gotham's favorite sons and the progeny of Lucius Fox, has taken on the role. Or at least we assume he's the progeny of Lucius Fox; there's no indication on the DC Comics or Batman Wiki pages that Lucius has a son who's named after him. 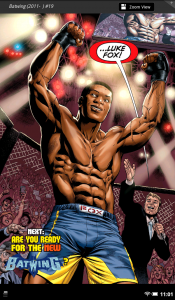 This New 52 creation appears to have been imported from the Batman Beyond universe. Interesting, then, that the Beyond series will just have hit Netflix and is getting new writers at the moment. Seems there may be some love at the publisher for those properties right now. In any event, it reduces the international flavor of the character and (along with the departure of Grant Morrison) throws the future of the whole Batman, Incorporated concept into question. Morrison recently expressed a desire to put all the toys back in the box before leaving the Batman titles after his eight-year run. Could this be a move in that direction?